Tap to add 1 colorless mana to your mana pool. If you have Urza's Mine, Urza's Tower, and Urza's Power Plant in play at the same time, tap to add 2 colorless mana to your mana pool. T Add 1 to your mana pool. 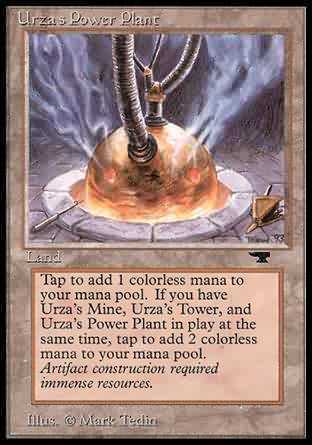 If you control an Urza's Mine and an Urza's Tower, add 2 to your mana pool instead. Artifact construction requires immense resources.